The reality of living in New York is this: You're always stuck toting around something annoying. Whether it's lugging gym clothes to the office or making sure you have a cute pair of shoes to swap for your comfy walking sneakers, practicality is never an afterthought, as it's crucial to every outfit. But, no surprise here, NYC gals also want to be on top of the trends, which can mean that sometimes you have to get creative. 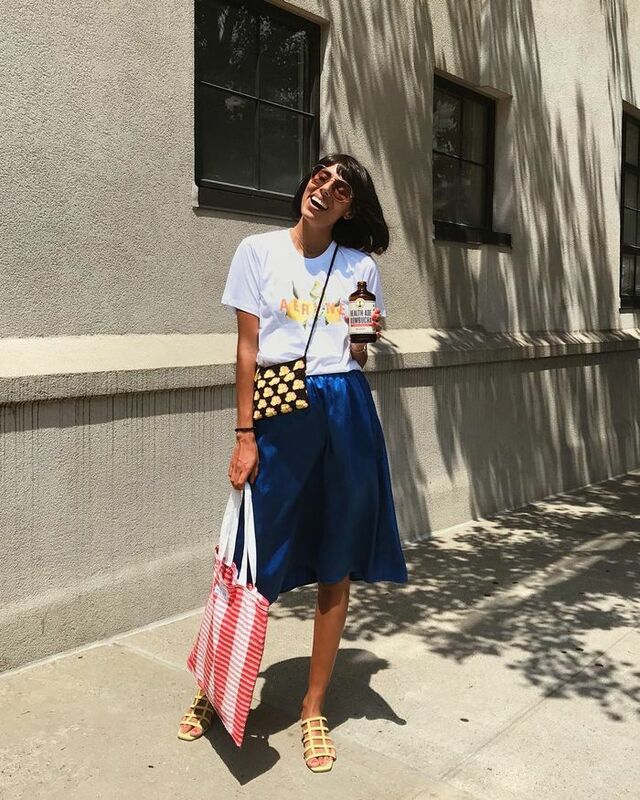 Baby bags don't exactly lend themselves to the NYC lifestyle, but that hasn't stopped the coolest girls from figuring out how to make things work. Instead of resorting to an oversize purse, they double up, putting just the essentials in an itty-bitty bag and throwing everything else into a practical tote. This combination makes for the ideal pairing because it allows for New Yorkers to keep tabs on whatever they may need throughout the day without ever having to sacrifice personal style. If you're going to have to bring along a big bag anyway, you might as well have fun with your purse of choice. Read on to see how they pull off this fun combo and to shop our favorite pairings too. A structured mini bag and a soft-flexible tote make for an easy combination. See-through bags—grocery or otherwise—aren't just for the exhibitionist. Use them to carry your necessities in style. Don't be afraid to mix and match textures and colors. There's no combination that you can't pull off. The only requirement: confidence. One cute trick to try: Tuck your smaller bag into a netted tote to show it off. New York women know that sometimes you have to get creative to make it home with everything you need. Paper or canvas totes pair well with bold jewel tones. If you're going for a streamlined look, try coordinating your purse and bag with your outfit. There will be no mistaking your pieces for anyone else's once you put your tote down at the bar. When traveling, keep your valuables in your small bag, which you can easily tuck into your tote should security get huffy. Now you're all set to pull off this NYC style trick yourself.